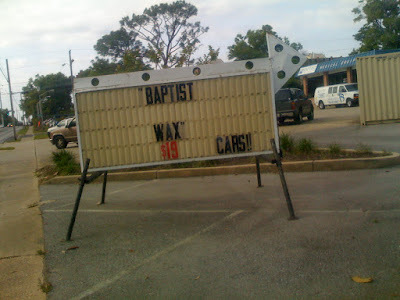 The “Blog” of “Unnecessary” Quotation Marks: "baptist wax"
Arnold spotted this near a Baptist hospital. It sounds delightfully sketchy. I wonder if it's different from an "Episcopalean wax." They melt candles onto your car? I know the catholics use beeswax in their candles..... is this made (like solent green) from melted baptist's? How does this differ from a "Brazilian"? >Dave said: How does this differ >from a "Brazilian"? First they baptize the car, then they wax it. "Obviously," they dunk the whole car in a tub of wax!